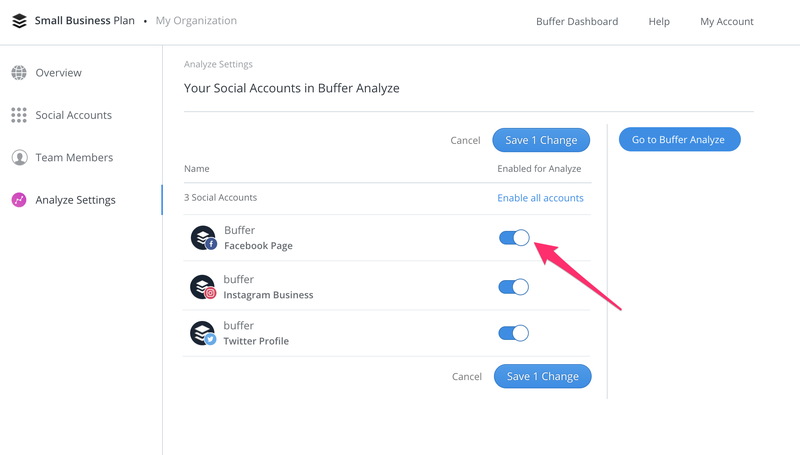 To enable or disable social accounts for Analyze, you’ll need to head over to you Publish dashboard. Analyze currently supports Twitter, Facebook Pages, and Instagram Business Profiles. Click the Admin link at the top of your dashboard and then click Analyze Settings. If you don't see this option in the Admin menu, please send an email to onboarding@buffer.com. Use the toggle to the right of each social account to enable or disable it for Analyze, and then click Save Changes.